If you’re a real estate agent, or you simply want to show someone how a certain location looks like, you might be interested in virtual tour software. These tools can create a virtual environment through which you can navigate with ease. If you’re looking for such tool, today we’re going to show you the best virtual tour software for your Windows 10 PC. 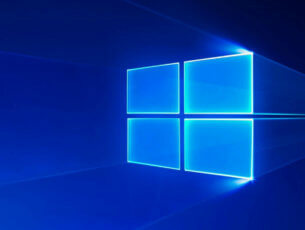 What is the best virtual tour software for Windows 10? This is a professional virtual tour software that allows you to create realistic 360 degree presentations. The application allows you to create virtual tour in Flash or in HTML5 format. Regarding the supported features, there’s Google / Bing map available that will show you the location and directions while viewing the presentation. 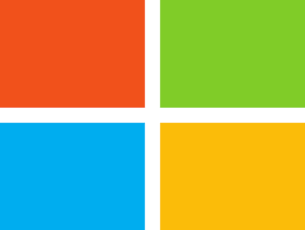 We have to mention that Bing map works only with Flash tours while Google Maps work with HTML5 tour. The application allows you to add multimedia elements such as voice narration and text to all your virtual tours. Tourweaver also supports interactivity, and you can add buttons and hotspots to your tours, thus making them interactive. The application also supports multiple scenes, and each scene is represented by a thumbnail. As a result, you can easily navigate to the desired scene. If you want to show more information during the tour, the application also supports popups that can show extra information. As for popup content, you can add images, text and links to your popups. Tourweaver also supports 3D models and you can add them to your virtual tours with ease. There are few limitations though, and you can only use models in 3ds format. In addition, 3D models are only available in Flash tours. Regarding the virtual tours, you can host them online and share them easily on Facebook. In addition, you can save your virtual tour locally as an exe file and send it to your clients. You can also save the tour in HTML5 format that will work on any mobile device. If you want, you can even create a local app of your virtual tour and run in on Android or iOS devices. Tourweaver is an amazing virtual tour software, and you can download the free trial version. There are Standard and Professional versions available, and if you want to get access to all features, we suggest that you use the Professional version. If you’re looking for a professional virtual tour software, we have to recommend 3DVista Virtual Tour. This application allows you to create interactive tours simply by using a set of pictures. This software offers great compatibility, and all your tours are compatible with any computer, tablet and Android or iOS device. There are two versions of this tool available, and Standard version is perfect for amateurs or first-time users. If you’re an advanced user or a professional, you might want to consider using the Pro version. The tool allows you to create tours that you can easily embed on an existing websites, which is rather useful. It’s worth mentioning that created tours don’t require any additional plugins or software in order to work. In addition, you can also export your tour to your local hard drive. This allows you to copy it to a USB flash drive or to send it via email. This application is simple to use, and you don’t need to have any programming skills in order to create impressive virtual tours. 3DVista Virtual Tour has a simple user interface, so it will be perfect for first-time users. It’s worth mentioning that 3DVista Virtual Tour can also optimize your tours for mobile devices. By using this feature you’ll create a smaller version of the virtual tour that will preserve the bandwidth of mobile users. The application works with all kinds of cameras and lenses, which is also a major plus. However, if you want to achieve the best results, we advise you to use wide angle lens, fisheye lens or one shot lens. In order to create interactive tours, the application will use automatic control points detection feature. This feature allows you to easily merge your pictures automatically. In addition, you can edit and create your own control points in order to get the optimal results. The application also supports HDR stitching, and you can combine multiple HDR images and create panoramas with a single click. 3DVista Virtual Tour also supports Live Panorama feature. This feature allows you to create time-lapse panoramas and show how the tour looks like at different times of the day. The application also has automatic color and exposure correction, so all your photos will be automatically adjusted before you merge them. The application supports 18 types of projections as well as Batch Stitching. This feature is great since it allows you to quickly stitch your panorama and add it to the queue. 3DVista Virtual Tour also supports audio, and you can add different audio files to your virtual tour. You can add natural sounds or voice narration, which can be rather useful. In addition, you can set the starting point of your panoramas as well as the spinning speed. You can also limit the speed and the zoom level for the users that are interacting with your panorama. Application also supports hotspots, and you can use hotspots to link two or more panoramas. Of course, you can hide your hotspots and make them appear only if you select them with your mouse. You can also use hotspots to show extra information. You can easily create a popup window with text, audio, image or video when clicking a hotspot. In addition, you can also open links in your browser by clicking hotspots. The application also supports Auto Pilot mode that will automatically guide the user. If you want, you can play audio, video or show the information window after reaching a certain waypoint. Of course, you can abandon Auto Pilot mode at any time. 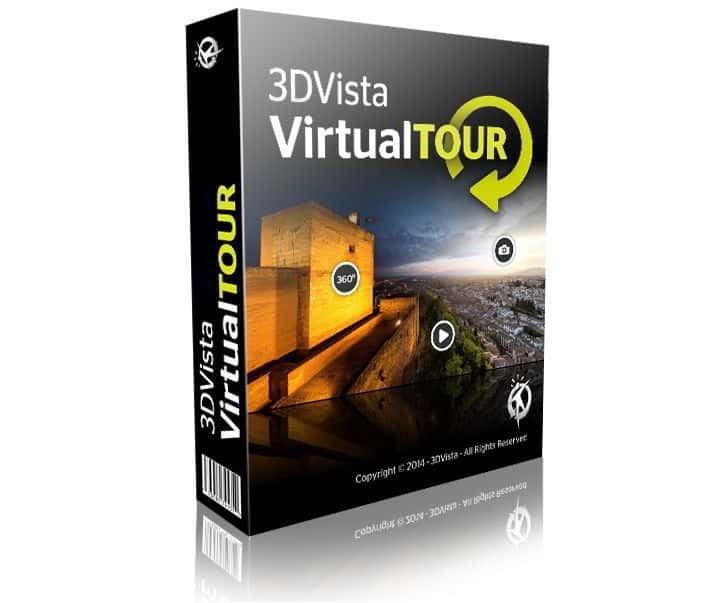 3DVista Virtual Tour is an amazing virtual tour software that will be perfect for professional users. You can download the free trial at any time, but if you want to continue using this tool, you need to purchase a license. If you’re looking for a cross-platform virtual tour software, we suggest that you have a look at Panotour. This application can make virtual tours that are fully compatible with any platform or device. Pantour has 6 different presets, but you can also create your unique presets and save them for later use. Changing the preset is simple, and you can do it with a single click. Interactivity is major part of any virtual tour, and this software also allows you to create hotspots. Application has advanced hotspot editor, and you can create custom hotspots with ease. Regarding the hotspots, you can use them to easily navigate to different scenes or to show additional information. The application has clean and simple user interface, so you won’t have any problems adjusting to this application. The application fully supports drag and drop method, and you can customize the interface any way you want. You can export your virtual tour locally to test it or to share it with others. All virtual tours are saved in .ptv format on your PC. The application also has support for maps, floor plans and compass. There’s support for GPS data in images and full support for Google Maps, Bing Maps and OpenStreetMap. If you want to create impressive virtual tours, you can do that thanks to Livepano plugin. With this plugin you can add video zones to your tours and create some amazing results. Regarding the supported formats, this application supports JPG, PNG, PSD/PSB, KRO, TIFF, MP4, M4V, OGG and WEBM formats. We also have to mention that there’s no limit on number of scenes that you can have in your virtual tour. Regarding the panoramas, you can have full spherical panoramas or partial panoramas. In addition, this application fully supports stereoscopic video, giant panoramas and groups of panoramas. Panotour allows you to add global sound for your virtual tour, but you can also add sound for each panorama. The application also supports customization, and you can enhance its features by adding third-party plugins. We also have to mention that this application has 124 different hotspot icons. There’s also support for auto-rotation and auto-tour. If you want, you can even set custom auto-rotation for each panorama. It’s worth mentioning that you can export virtual tours in HTML5 format, but you can also add support for Adobe Flash. If you’re a fan of virtual reality, you can even export the virtual tour in a VR Mode. 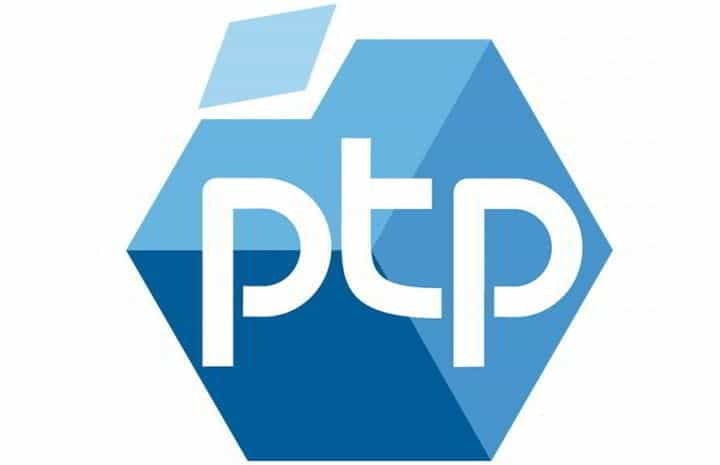 The application also supports FTP servers thus allowing you to upload your virtual tours online with ease. Pantour is an amazing virtual tour software, and it will be perfect for professionals. Regarding the availability, you can download the free trial version. We have to mention that there are two versions available, so if you want to have access to all advanced features, we recommend that you download the Pro version. If you want to create virtual tours and panoramas, you might be interested in Pano2VR. This application comes with a special Patches mode that lets you fix your images. For example, if you use a tripod to create a panorama, you can use this tool to remove the tripod or any other object from your panorama. To do that, simply select the area that you want to fix in order to extract it. After that, open it in your image editor and apply the necessary changes. After doing that, the changes will be applied to your panorama as well. The application also has Leveling tool that allows you to straighten the horizon of your panoramas easily. Pano2VR allows you to create virtual tours easily thanks to the Automatic Linking feature. If you want to change linking or the location, you can do so by using the Tour Map feature. Of course, you can filter your images using tags. The application has a Master Node feature that allows you to add information or patches to all your nodes. The software also supports interactivity, and you can add hotspots to your panoramas. In addition, you can also add directional sound and videos. It’s worth mentioning that you can use hotspots to show additional information such as text, video or image. There’s also a Skin Editor that lets you create custom buttons and controllers for your presentations. Pano2VR also supports automated virtual tours. This is perfect if you don’t want users to interact or interfere with your presentation. Of course, you can stop the automatic tour at any time and navigate freely. In addition, you can also export the automatic tour as a video file and share it with others. Regarding the file export, you can save your tours in HTML5, Flash and QuickTime VR formats. We have to mention that this tool supports wide range of plugins so you can easily upload your virtual tour to WordPress, Joomla or Drupal website. Pano2VR is a solid virtual tour software, and you can download and try it for free. There are two versions available, and if you want to get access to all features, we suggest that you purchase the Pro version. If you’re looking for cloud-based virtual tour software, this is the perfect choice for you. This application is mobile friendly, and it will adapt to any screen size and any device. Vtility also offers simple and straightforward user interface, so you can easily create virtual tours. The application is fully built in HTML5, so it doesn’t require any third-party plugins in order to work. Thanks to the HTML5 technology, you can embed your presentation to any website with ease. We also have to mention that this web app doesn’t require any special photography gear, which is a major plus. The application offers simple interface, and you can add hotspots for simple navigation through different scenes. We have to mention that this service isn’t free, so you’ll need to purchase a package in order to use it. The main difference between the packages is the number of supported virtual tours that you can have at a time. The most basic package offers only one virtual tour which should be enough for the most basic users. We also have to mention that certain packages have ads, so you might want to choose your package carefully. Vtility is a decent virtual tour web app, and more affordable solution compared to other virtual tour software. Since this is a web app, it lacks certain advanced features, but it should be perfect for basic users. MakeVT is another virtual tour web app. Just like any other virtual tour software, this one allows you to use spherical or cylindrical panoramas. We have to mention that this web app works only with panoramas in .jpg format. After uploading your panorama, you can edit it by adding hotspots to it. You can switch between panoramas with ease by using hotspots. In addition, you can add popup images, text and external links thanks to hotspots. MakeVT also supports sharing, so you can publish your virtual tour online or share it on social networks. In addition, you can also embed the virtual tour to any website with ease. Alternatively, you can simply share the link to your virtual tour with others. We have to mention that this service comes with several pricing plans. If you want your tours to work on mobile devices and use custom styles or icons, you might want to use the Ultimate plan. Each plan offers different features, so we strongly advise you to check the list of available features before choosing a specific plan. MakeVT looks like a decent virtual tour web app, and you can try it out for free. 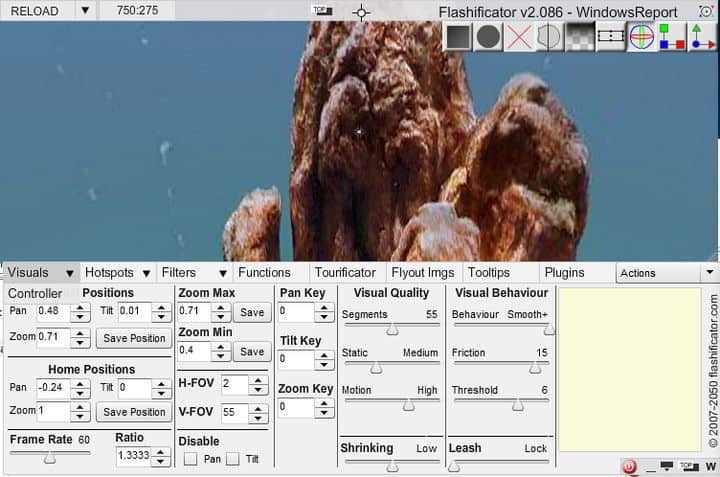 Flashificator is an Adobe AIR application that you can use to create panoramas and virtual tours. The application has several tabs and you can change the camera position and set the minimum and maximum zoom levels. In addition, you can disable panning or titling if you want. The application supports hotspots and it also allows you to make image adjustments. Flashificator also supports various functions and events that you can use to create complex virtual tours. In addition, there are various plugins available such as MP3 player, video player, URL linker, clock, etc. We have to admit that Flashificator can be a bit overwhelming with its options, and first-time users might have issues adjusting to this tool. It seems that this virtual tour software offers wide range of advanced features, but with its complex interface it might turn down some users. If you’re an experienced user, you might want to try Flashificator, but basic users will probably want something more user-friendly. If you’re interested in this tool, you can download it and try it out for free. Unlike other virtual tour software on our list, this one is completely free. In fact, JACT is available as portable application, so you don’t even have to install it in order to run it. The application can create complex panoramic tours or simple panoramas with ease. Speaking of panoramas, the application has a gallery that you can use to quickly navigate to specific scenes. Just like other similar tools, this application supports interactive hotspots. Regarding hotspots, you can create point and polygonal hotspots with ease. In addition, you can add sound spots and directional sound as well. To make the creation process simpler, the tool also supports automatic hotspot creation. Additional features include support for map and floor plan which is quite useful, as well as preview for your panoramas. 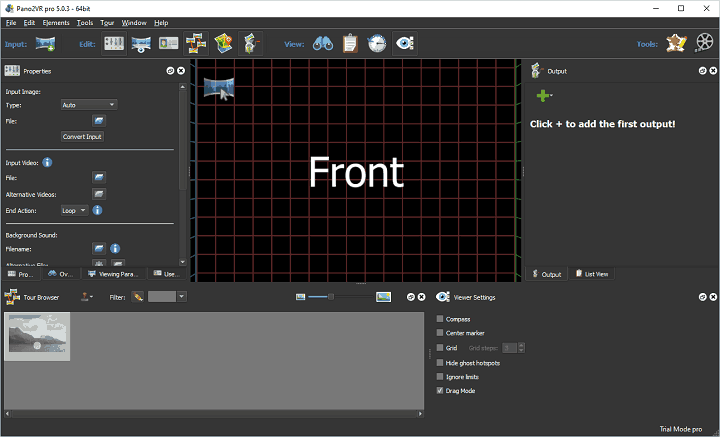 JACT is a relatively simple virtual tour software, and it offers the most basic features to its users. Despite the limited number of features, JACT is still a free virtual tour software, so if you’re on a tight budget, we recommend that you check it out. 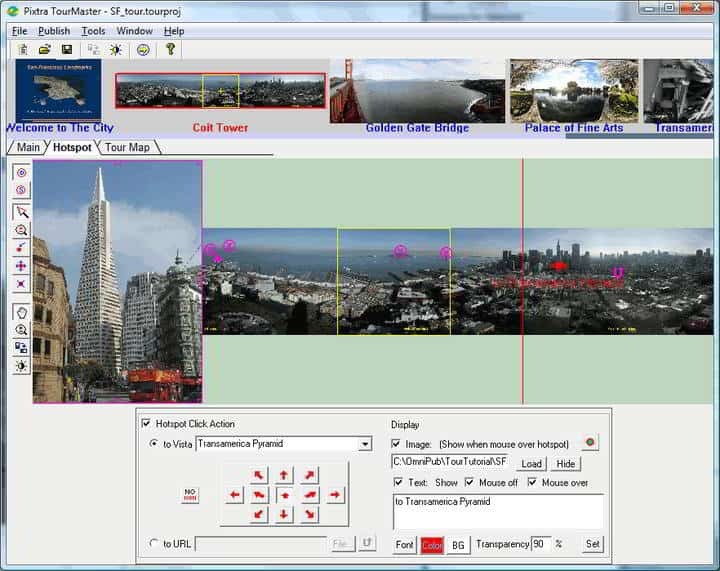 Another virtual tour software that we need to mention is TourMaster. This tools supports spherical, full, vertical and partial panoramas. The application also supports Tour Movie mode that will automatically guide the user through the presentation. If necessary, user can cancel the automatic tour at any time. In addition, the application supports Tour Map feature as well. There are also tour map pages and static hotspots that can show additional information such as text, image or URL. There’s also support for sound tracks, so you can play music or narration during the tour. The application also allows you to export your tour and add it to any web page with ease. We have to mention that this is an older application, so it doesn’t have a sleek user interface and some advanced features like other entries on our list. Despite these minor flaws, TourMaster is still a decent virtual tour software. 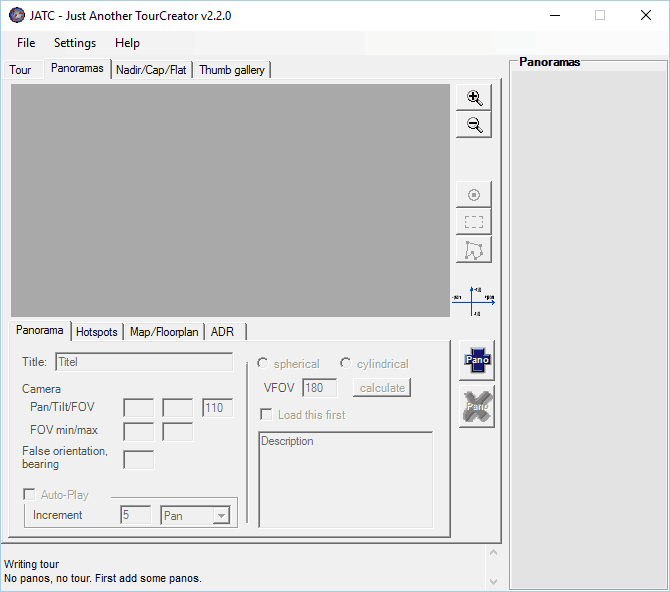 You can download and try TourMaster for free, but you’ll need to purchase a license if you want to continue using it. Virtual tour software is perfect for real estate agents or any users that want to make beautiful and interactive panoramas. There are many great virtual tour applications, and we hope that you found a suitable one for you on our list.